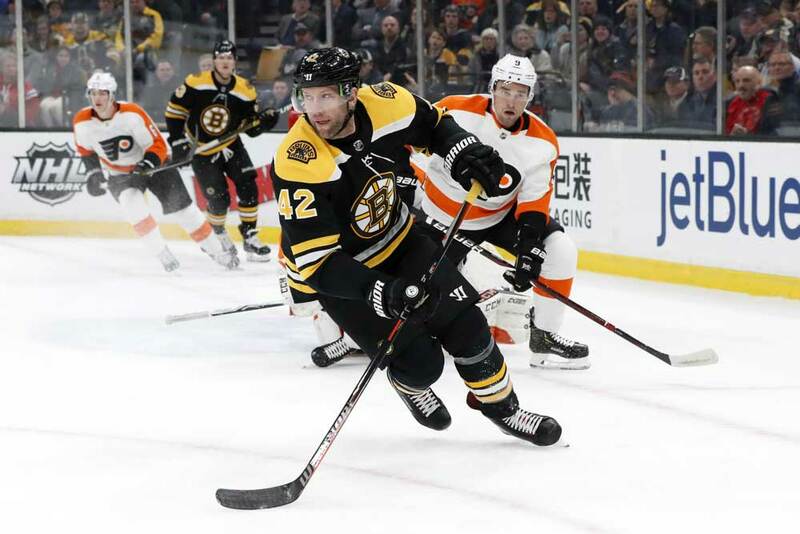 While the NHL trade deadline remains several weeks away, the Boston Bruins are running out of time to turn things around. Their recent 2-3-3 skid has opened the door for Montreal to pass them in the Atlantic Division, and if they don’t address their most pressing issue soon, they may watch a playoff berth slip right through their fingers. General manager Don Sweeney’s top priority should be obvious: secondary scoring. Boston’s phenomenal first line of Patrice Bergeron (44 points in 35 games), Brad Marchand (57 points in 50 games) and David Pastrnak (61 points in 51 games) has found the back of the net 65 times this season, which amounts to 44% of the club’s total. They often resemble the Harlem Globetrotters out there, slicing through opposing defenses like it’s a walk in the park. However, single-handedly powering a playoff-caliber offense is proving difficult. You can’t fault David Krejci (40 points in 51 games). The 32-year-old playmaker has fared well despite absolutely no winger support and only modest power-play contributions. Youngster Jake DeBrusk (18 points in 41 games) is still finding his game and certainly hasn’t figured out how to maximize the touches that Krejci grants him. Due to conflicting play styles, they’re rarely on the same page. DeBrusk races forward in north-south fashion, whereas Krejci has a craftier and more patient approach that requires wingers who can create separation in high-percentage areas. They’re both valuable pieces individually, but their 1.75 GF60 together is downright pitiful. In the Bruins’ last three games, only one player from the other three forward lines has managed to score a goal. Unsurprisingly, each contest resulted in a loss. The most frustrating part of this predicament is the club’s otherwise solid performance. During this rough patch, Boston is controlling 56.5% of the shot attempts at 5-on-5 but simply can’t muster any depth scoring. In many ways, the team currently resembles this year’s Carolina Hurricanes as a group that deserves more wins than it’s piled up. Unfortunately, merit only gets you so far. Though the solution is clear, the ideal target isn’t. First and foremost, the team must focus on an actual upgrade. Acquiring a washed-up Rick Nash doesn’t count. Sportsnet’s Elliotte Friedman suggested that Boston is interested in Philadelphia Flyers winger Wayne Simmonds. As a gritty veteran who can hold his own on the cycle, he seems like a natural fit in Beantown. However, he lacks pure finish and relies heavily on the power play to produce. That’s not a negative trait in and of itself, but considering the Bruins already rank second on the man advantage, Simmonds’ impact would be redundant. Moreover, he comes with serious two-way shortcomings. Dealing away high picks or prospects for a subpar even-strength scorer with poor team-relative metrics over the past three seasons…doesn’t sound like the wisest move. If the Bruins are hoping to pair Krejci with a Milan Lucic-type power forward, perhaps Micheal Ferland (25 points in 41 games) would be worth a shot. The 26-year-old Hurricane is in his prime and offers much of the same skill set that Lucic once did as a Bruin, but with less of an intimidation factor. At 6’1” and 217 pounds, he can thump and has underrated offensive instincts. Given how serious Boston’s lack of depth is, though, you get the sense that Sweeney would prefer a bona fide goal scorer. Pending unrestricted free agent Ryan Dzingel (38 points in 48 games) is another possibility. Since Ottawa Senators owner Eugene Melnyk is rather stingy, the 26-year-old speedster is very much on the table. Unfortunately, Dzingel is a straight-line burner who may not jive particularly well with Krejci’s east-west inclinations. Well, what about the biggest fish available? Columbus Blue Jackets winger Artemi Panarin (57 points in 48 games) is a wizard with the puck and a very intriguing fit next to Krejci due to his ability to control the flow of the game. He can hurt you off the rush or stop up and use his vision to carve out a great opportunity. Not only are his raw numbers terrific, he routinely carries his club in shot, scoring chance and goal shares. He’s precisely the sort of world-class talent that Boston covets. Well, every team does — and that’s the problem. Even though the 27-year-old is an upcoming UFA, he would command a king’s ransom in return. That same concern looms over Ottawa Senators two-way stud Mark Stone (50 points in 50 games) and St. Louis Blues sniper Vladimir Tarasenko (32 points in 48 games). Boston isn’t exactly overflowing with top-tier futures and would struggle to win a bidding war for one of these stars’ services. If sacrificing one of its young defensemen (Charlie McAvoy, Brandon Carlo) is required to pull off a deal, that opens a whole other can of worms on the blue line. The Bruins won’t find an internal upgrade either. While Peter Cehlarik has looked like a good stylistic match for Krejci, the duo suffers from the same old lack of production (1.98 GF60). Danton Heinen hasn’t made his cracks at a larger role count this season (2.07 GF60). Meanwhile, former second-round picks Ryan Donato (9 points in 34 games) and Jakob Forsbacka Karlsson (9 points in 28 games) don’t seem ready for top-six roles yet. Some might preach patience and point to a longer-term outlook, but Bergeron (33) isn’t getting any younger. This championship window is closing with each passing game, so management needs to get on its horse and work the phones in order to capitalize on what the two-way marvel has left in the tank. The dominoes are already starting to fall. If Boston does acquire a forward, he’ll also need time to adjust to his new environment. Krejci is quite talented, but he isn’t necessarily easy to play with. Learning his timing and tendencies won’t happen overnight, so the club can’t afford to wait with bubble teams nipping at its heels in the Eastern Conference. Truth be told, Sweeney is in a sticky situation here. Some targets are questionable fits, whereas others are likely outside the Bruins’ price range. There is no perfect move, but in the case of this particular team, you have to pull the trigger anyway. Reaching for a star — even the wrong one — is better than simply letting your team sink.